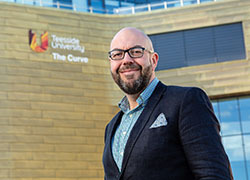 A company which offers innovative and environmentally-friendly water treatment solutions is being helped to find new markets thanks to the support of Teesside University. (R-L) John Fraser (Managing Director, Biochemica), Katherine Rowell (Account Director, Scarab 4) and Kane Elgey (Marketing Assistant, Biochemica). 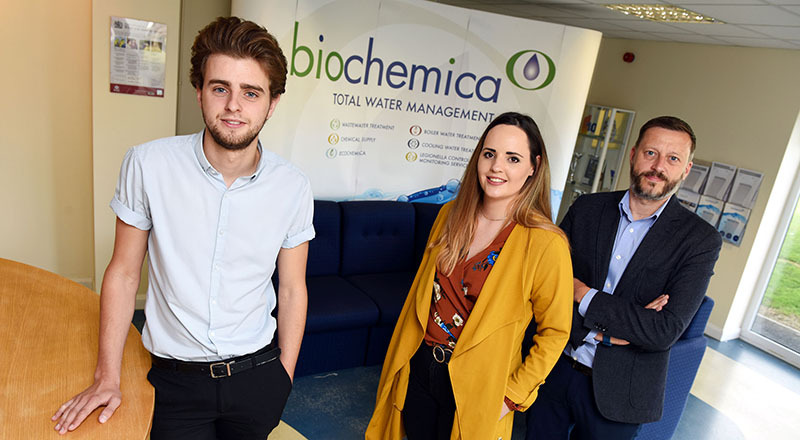 Billingham-based Biochemica Water received support from the Innovate Tees Valley programme when it wanted to update the way in which it marketed itself online and digitally. Through the programme, Teesside University marketing graduate Kane Elgey was brought into the company on a Knowledge Exchange Internship (KEI). Kane’s salary was part-funded by Innovate Tees Valley and he also received advice and support from professionals at marketing and PR company Scarab4 based in Prestwick Park, Newcastle upon Tyne. Biochemica Water provides innovative wastewater treatment products and technical services to clients across the UK. It offers bespoke and comprehensive solutions to tackle all manner of water-related challenges to multiple industries. John Fraser, managing director, said: 'Before Kane joined us, we didn’t really have a joined-up strategy in relation to our marketing. 'We had a little bit of social media and we took part in some events, but it wasn’t really linked to what we’re doing in terms of sales. 'One of the things that Kane has been able to do is establish a link between our marketing and social media and our sales. Katherine Rowell, an account director at Scarab4, who supervised Kane throughout the KEI, added: 'It has been great to work with a company that recognises the value in upskilling its recently graduated employees with on the job training and the KEI programme is an excellent platform allowing businesses to do this. 'We have provided SEO and PPC training to Kane that will significantly help the company in terms of increasing its search engine rankings. 'We have also worked closely with Kane to understand Biochemica’s customers, their needs and motivations and how to most effectively appeal to diverse target markets. This has resulted in Biochemica having a much tighter marketing strategy moving forward that will generate significant results.' 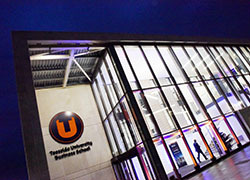 Innovate Tees Valley is a Teesside University-led programme which helps SMEs do new things in their business and create and improve services, products and processes. It is formed from a partnership of Teesside University, DigitalCity, Nepic and MPI with funding from the European Regional Development Fund. 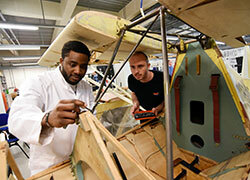 Innovate Tees Valley project manager Suhail Aslam said: 'Accessing new markets is a key way in which SMEs can innovate.